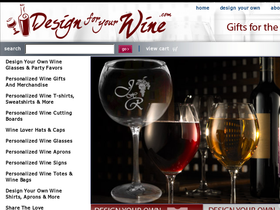 DesignForYourWine.com caters to the wine lover in you. They will personalize just about everything having to do with wine and it's consumption. You'll find wine glasses, aprons, t-shirts, cutting boards, hats & caps, signs, jewelry, totes & wine bags. Personalize your favorite item for yourself or for a gift at DesignForYourWine.com. Save on your next purchase from DesignForYourWine.com with DesignForYourWine.com discounts, DesignForYourWine.com coupons and DesignForYourWine.com savings from 58coupons.com. Stock up on your own personalized designs from Design for Your Wine and you can save up to 30% with volume discounts. Design For Your Wine has these great t-shirts in various colors and as low as $13.25 when you buy them in quantities. Click link for details. Create your own personalized wine gifts at DesignForYourWine.com. Gifts start from just $14.95 and include custom wine glasses, aprons, shirts, totes, and more. These fabulous aprons come in various colors and have been discounted to $22.95 from DesignForYourWine.com. Click link to view.